A special formulation containing essential ingredients with Zinc PCA to deep clean with low suds into the pores of the skin. It deodorizes while enhancing protein and stimulating collagen growth and regulating sebaceous glands. This product also contains peppermint oil to prevent bacteria and fungus from being present on the scalp and to prevent irritation. 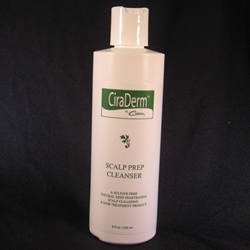 This product is not intended to shampoo the hair, but to cleanse excessive buildup from the scalp and maintain its health. A “green” based product, as it contains no sulfate.